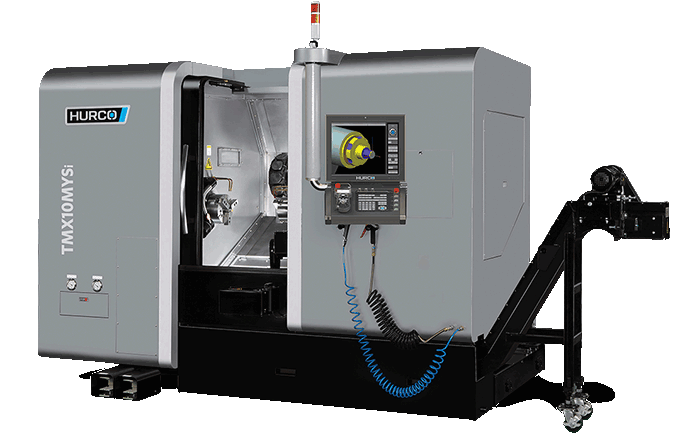 The TMXMY/S mill turn lathes are true slant-bed lathes with all-digital drives and motors and absolute encoders on all linear axes. The addition of the Y-axis allows you to machine a pocket with straight walls and flat bottoms or perform off-center machining operations with just a click of a box. 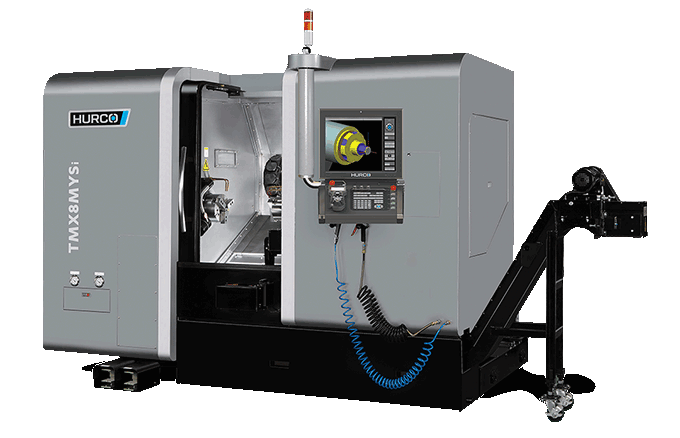 The TMXMY/MYS slant-bed lathes simplify multi-axis turning. The Hurco multi-axis mill turn line serves a number of industry applications. The most significant advantage of the multi-axis TMXMY/TMXMYS mill turn machines is the simplified programming and operation via the control. By simply checking a box, the control activates linear Y-axis motion. The sub-spindle functions are similarly straightforward. Learn more about mill turn control features. Beyond the control technology, the TMXMY and TMXMYS mill turn machines have multiple design features that prove valuable for mill turn applications. Design + Construction: It starts with a certified Meehanite® casting, which provides superb dampening characteristics that inhibit thermal deformation and twisting. This robust machine tool features oversized guide rails that are strategically spaced to provide excellent support to the cross slide. A wide saddle increases rigidity even further. Ultimately, all of these design features mean the TMXMY/MYS mill turn lathes can withstand heavier loads and more momentum. Servo Turret: Fast Duplomatic servo turret with 12- driven tool stations is designed to provide faster and more accurate tool indexes. You can use any combination of ID and OD tool holders. Heat Isolation System: Because heat is the enemy of machine tools, we’ve designed our TMXMY/MYS mill turn lathes to promote thermal stability by isolating heat producing components and adding a spindle chiller. At the heart of the TMXMY/MYS mill turn machines is the flexibility of the integrated Hurco control powered by WinMax®. The power of our control technology is even more impressive when you see how easy it is to program multi-axis mill turn applications and subspindle operations. Learn more about specific mill turn control features. Simplified Y-axis milling: To simplify programming for multiple axes, you simply check a box to indicate you want to use the Y-axis for axial and radial machining operations such as holes and contours. Crash protection: In order to avoid crashing into other machine components while using a Position Block to position the axes, the operator is required to define which order each axis moves. Easy Tool Setup: You can mount multiple tools in the same turret station. Simply define the station where the tool is located. This gives you a quick and easy way to reassign tools to different stations. Stage 1 - Program the sub-spindle positioning and clamping of the part. Stage 2 - Program the release of the part from the main spindle and re-position the sub spindle. The control’s graphical verification feature simulates the main and sub spindle. 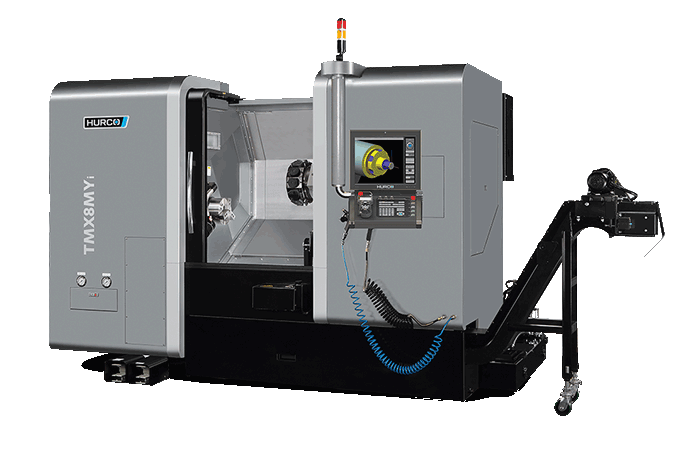 In addition to the mill turn and sub-spindle control features described above, the Hurco mill turn machines have all of the popular productivity features found in our TMX lathes. DXF Transfer: Eliminates the need to hand code complex profiles by importing the 2D toolpath geometry directly into the control. Conversational Programming: Our founder invented this intuitive, straightforward programming method that leverages the power of technology to do what software does best—the redundant and mathematical tasks—and leaves the machining expertise to you. Features such as AutoCalc, Constant Surface Speed, and Diameter or Radius Programming, are just a few examples of how conversational programming simplifies complex processes. Compared to the years we have been developing control technology and machining centers, our mill turn experience seems short. However, we've leveraged our overall machine tool experience and efficient process approach to ensure that each decision we make meets our objective to deliver manufacturing technology that helps our customers increase profitability. Our founder grew up helping his grandfather in the family tool and die shop. 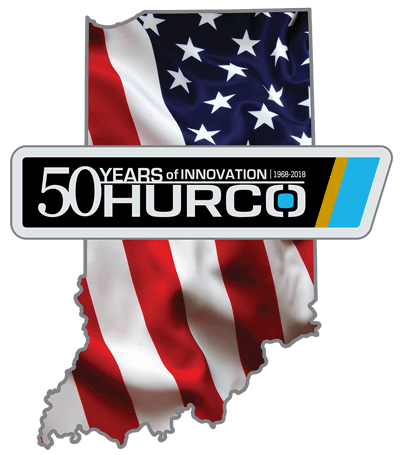 He started Hurco to “simplify the work of the machinist through the use of technology.” We employ this mission in each product we develop. Through our 40+ years building machine tools, we know that premium components and expert design are critical, and we know how to minimize non-cutting time operations, such as setup and programming. When you invest in a Hurco TMXMY or TMXMYS mill turn machine, you will benefit from our experience and our culture of innovation. 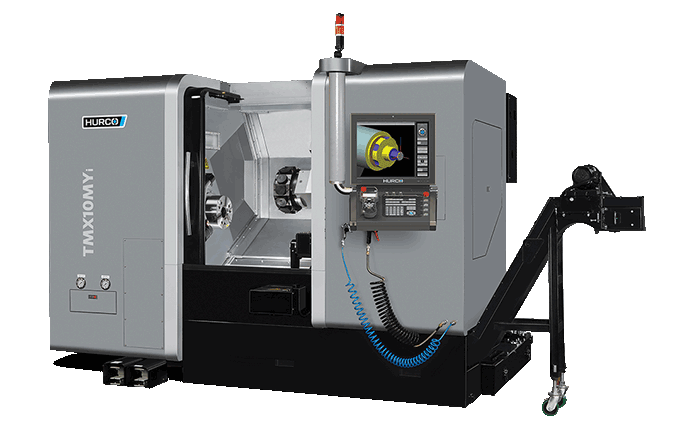 Learn more about the features that make the TMX mill turn lathes the best choice for high performance turning and milling operations. In general, the TMXMY/MYS mill turn machines are invaluable when part tolerances are critical or when saving floor space is necessary. The Hurco mill turn lathes preserve accuracy because the process enables seamless integration of a true “one and done” operation so you don’t lose accuracy or waste time with multiple setups. While some shop owners believe the purchase of a turning center and a machining center makes more sense economically, a general rule of which strategy is best—a mill turn machine or a lathe/mill cell, is the amount of milling the part requires. If more than 25% requires milling, you should seriously consider purchasing a turning center and a mill instead of a mill turn machine. Specific applications that have benefitted from a mill turn process include automotive parts, such as an axel forging; medical parts, such as bone implants; aerospace/defense parts, such as missile components; specialty equipment, such as parts made for packaging equipment; and electronics components, such as connectors. In these applications, the part is primarily a turned part with light milling required. Our control technology is the greatest advantage of mill turn machines because the technology we develop yields the greatest opportunity for our customers to increase profitability via increased productivity. With large capacity memory, a fast processor, and multiple control features that minimize setup time, you will benefit from a control that helps you get from print to part faster. All Hurco, mill turn machines are built for increased rigidity with an extra wide saddle and larger Z-axis rails. You can be assured our TMXMY and TMXMYS mill turn machines have the premium components and rigidity required. Front loading coolant tank and chip conveyor design to minimize maintenance and provide easy access. The short, live-tool drive train generates less heat, and provides more horsepower and torque transfer to the tool, higher reliability, and quieter operation. Ball screws: For feed drive elements, Hurco only uses premium, quality designed, pre-tensioned, double-nut ball screws. With up to 98% efficiency, the re-circulating ball nut ensures low friction power transmission from the screw to the slide. This guarantees the combination of high accuracy, high rapid traverse rates, and high feed thrust. Large diameter double-nut ball screws are hardened and ground, centered between the guide ways, and anchored at both ends with pre-loaded ABEC-7 precision class angular contact thrust bearings. This combination prevents backlash and provides outstanding positioning repeatability with virtually no thermal growth. Fully Programmable Tail Stock: The heavy duty, programmable tail stock ways are hardened and ground with precise alignment for accurate center positioning. The tail stock is fully programmable from the control. You can activate the quill with a footswitch or from the control with an M function.